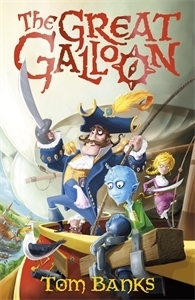 The Great Galloon is an enormous galleon suspended from a huge balloon – a skygoing vessel the size of a small town, captained by the larger-than-life, heroic, but melancholic Captain Meredith Anstruther, a giant of a man who commands supreme loyalty from his bizarre crew. Chief amongst the inhabitants of the galloon is Stanley Crumplehorn, a young… well, I was going to say “a young man” but he’s covered in grey-blue fur and he has a small crumpled unicorn-like horn in the middle of his forehead and no-one seems to know quite what he is, so I’ll just call him a “young person” instead. Stanley isn’t the most unusual member of the crew, of course – in fact he fits right in with the band of misfits. There’s the not-so-able Able Skyman Abel, whose cowardice and incompetence are a sharp contrast to the heroic captain; Rasmussen, Stanley’s best friend and partner-in-adventures who may look like a normal young woman but is a force of nature when it comes to seeking out adventure; Cloudier the goth who just isn’t all that good at being gloomy; and the Brunt, who is… well, read the book, and you’ll see all about the Brunt. There are Seagles (seagulls the size of eagles) and BeheMoths (giant balloon-eating moths) and an alarming, thundering, rumbling, mysterious sound that threatens to shake the galloon from the sky. The story cracks on at a terrific pace, as Stanley and Rasmussen seek out adventure and excitement and mystery. It’s a genuinely funny book, too, with quirky characters and inventive use of language. Special praise has to go to John Kelly, whose charming illustrations provide the perfect companions to the text. “Muum,” wailed Cloudier, with the diphthong that only a thirteen-year-old girl can pronounce. 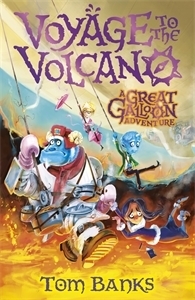 It’s a quick read, and a real page-turner – I think I got through the book in just two sessions – but there’s good news when you get to the end – the sequel, Voyage to the Volcano is already out. It’s on my “to-read” pile, and I don’t think it’ll be long before I get around to reading it. Here’s to even more adventures of Stanley and Rasmussen on the Great Galloon!